Catch the holiday spirit with Scrooge, Tiny Tim, Bob Cratchit, and all the rest in Theatreworks’ heartwarming musical based on the Dickens classic. Dickens Village is a festive gift from the business community to local residents and visitors. Enjoy horse-drawn carriage rides, carolers, concerts, refreshments, children’s activities, and more. This treasured community tradition opens in December and runs every Saturday until Christmas. A detailed schedule of events is listed on the website. Breakfast with Santa takes place Saturday, December 10. Tickets are limited and available on a first-come, first-served basis at Village Wine Shop for the St. James’s Gate location, at No. 165 for the Village Trattoria, and at Cedar Ridge Cafe. Join ther Menorah Lighting on Monday, December 18, at 6:15 p.m. Enjoy a festive Breakfast with Santa Buffet, including made-to-order omelets, silver dollar pancakes, bacon, sausage, salads, fresh fruit and caroling by the talented Bernards High School Madrigals Choir. Meet and take photographs with Santa and delight in the spectacular Gingerbread House. Special holiday treat tables for children will feature gingerbread and a selection of holiday cookies, cupcakes, candy canes, and more. Breakfast with Santa at The Inn is a wonderful family holiday experience. Please call (908) 766-0002 for reservations and additional information or visit their website. Luckily, PAW Patrol comes to the rescue! Ryder summons Marshall, Chase, Skye, Rubble, Rocky, Zuma, and the newest pup, Everest, to rescue Mayor Goodway and to run the race in her place. Expect lots of laughs and life lessons for all ages during this magical adventure. Performances will take place at 10 a.m., 2 p.m., and 6 p.m. on Saturday, December 9, and 10 a.m. and 2 p.m. on Sunday, December 10. Tickets (from $25) may be purchased online. 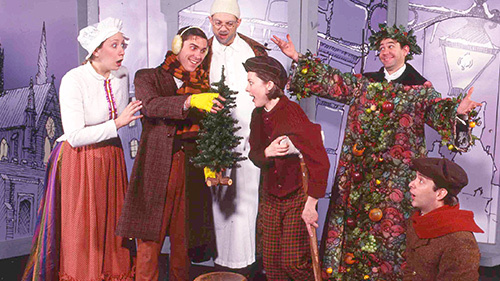 Enjoy this hilarious holiday classic at Mayo with the kids. This is a free event, but you must make reservations. And don't forget about some recurring events which I've written about in previous weeks like The Polar Express train ride at the Whippany Rail Museum, The Nutcracker at Mayo Performing Arts Center or at South Orange Performing Arts Center, the Gingerbread Wonderland at the Freylinghuysen Arboretum, The Holiday Festival in the Morristown Village Green, the 60th Annual Model Railroad Show and Annie at Papermill Playhouse! !